Since the 1862 exhibition in London of the archaeological discoveries at Thebes, the lost kingdoms of Egypt and Babylon had excited the public imagination. Visits to the British Museum, illustrated magazine articles on archaeology, and the ancient histories of Herodotus had instilled in Long a desire to see for himself. 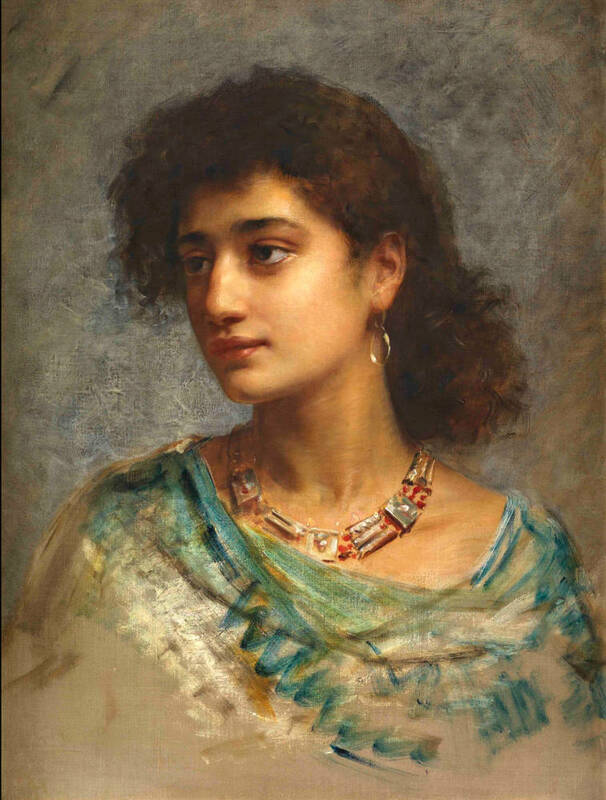 After travelling to Egypt in 1874, the paintings he exhibited in 1877 at the Royal Academy caused a sensation, and made his name; he had found his subject. The title of this picture means ‘Delight of the Home’ in French phonetic Arabic, but the finished painting was also known as An Eastern Dancing Girl. It is a study for Long’s Royal Academy Diploma Work, painted in 1881 and exhibited there in 1882 (‘a careful study, full of the most refined feeling for colour’, wrote a critic). This was the zenith of his highly successful career, the year his elaborate Babylonian Marriage Market sold at auction for 6000 guineas - at that time the highest price ever paid for the work of a living artist.